With the growing interest in Spirit Contact & Life After Death, there have been a number of intriguing developments in ITC/EVP devices put out on the market. 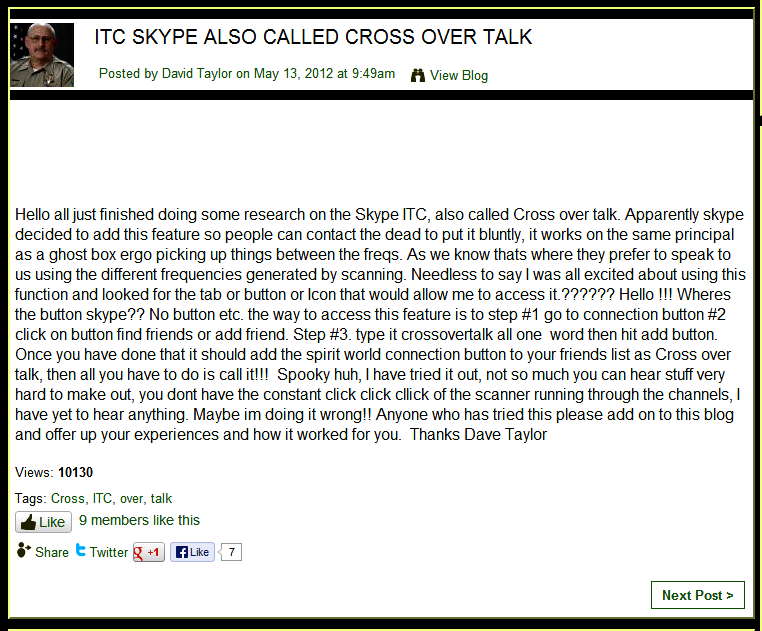 The first of these is SKYPE CROSSOVERTALK, an EVP device designed and supported by www.DigitalDowsing.com. For those millions familiar with the SKYPE application for web-camming, calling the dead is no more difficult than calling the living. You simply type CROSSOVERTALK into the "add contact" line, and wait for the system to 'accept' you as a friend. And it is free. But due to the recent high volume of interest in this method, calls are now being limited to 10-minutes per caller. To begin experimenting for SKYPE newcomers, download the SKYPE application from www.skype.com and install it. Follow the easy instructions above, or read the net-blurb below (click to enlarge). What follows after are four videos related to the CrossOverTalk phenomenon, for those wishing a preview of the experience. THREE OF THE BEST online shops for gadgets and devices related to Ghost Hunting, are given below. All three shops offer a full line of equipment (from books to dowsing rods to Ghostboxes, to a modern version of George Meeks' SPIRICOM). Click on the logos below. WHAT FOLLOWS are four PC programs which can be downloaded and installed, to further explore the world of Transcommunication. Additional information on the programs, installation & use, can be found by searching the program name online.